The Summarize command uses the thresholds set in your project options to fail the build from the command line. It will then check the thresholds against that execution, printing out any that fail. If any thresholds fail, NCover will return a non-zero exit code to indicate an error. This should fail most builds. There is no visual indication of the return code, but when you run a subprogram you can programatically check this code. Build servers usually react to the return code. If the error return code alone is not enough to fail the build, all the major build tools (TeamCity, CC.NET, Hudson, Jenkins, etc.) have options to fail the build based on certain words in the output. In this case, they can fail if the phrase "Threshold Failed" occur. Once the build is complete, the command line will print out a summary of the last completed execution. Note: The Summarize command is also available as a parameter in the NCover Run command. --wait      If this option is specified and the project specified is currently collecting, NCover will wait until the unfinished execution is complete before printing the summary. 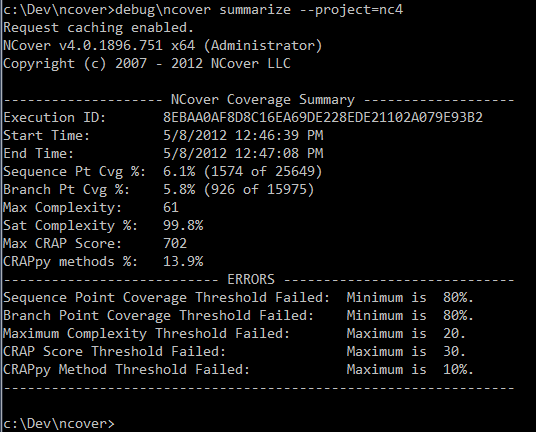 When testing is complete, close your tested application and NCover will automatically start compiling the completed coverage data.